The controversy surrounding e-cigarettes continues with the release of new research indicating that many teens’ first exposure to tobacco was in the way of flavored products. A new study shows that four out of five teens ages 12 to 17, who have used tobacco, report using a flavored product first, HealthDay reports. The research was conducted by the Food and Drug Administration (FDA). Over the last year there have been a lot of concerns raised by health experts and lawmakers about the appeal of e-cigarettes to minors. Many e-cigarette nicotine juices come in fruity flavors, a number of which have names that are similar to candy. Naturally, some teens will be more apt to try nicotine that tastes like strawberries. The findings come from a nationally representative survey of 13,651 teens, according to the article. The researchers found that about 21 percent of teenagers report using tobacco. Of those who reported using tobacco, about 81 percent said the first tobacco product they smoked had flavoring. 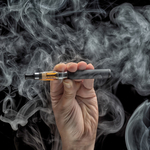 "Flavored tobacco products have become increasingly common in the United States and are especially attractive to youth," said FDA spokesman Michael Felberbaum. "As such, the FDA is particularly interested in monitoring and assessing the use of flavored tobacco products among youth."